Some public sector positions can only be filled on a permanent basis by the appointment of a person who has passed a civil service examination and attained a reachable score. These are called competitive class positions. The civil service examination for each differently titled competitive class position varies, and the tests being offered by Chenango County change periodically. The eligible list established as a result of each civil service examination is used to fill competitive class vacancies in Chenango County departments, or towns, villages, special districts, and certain school districts within the county. 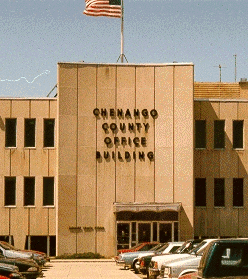 Chenango County eligible lists are not used to fill vacancies at the City of Norwich or the Norwich City School District. The Civil Service examinations Chenango County is currently accepting applications for are listed below. Applications for examinations must be postmarked or submitted to the Chenango County Personnel Department by the Date Shown in the "Last Day to Apply" column of the following chart in order to receive consideration. If you are having problems opening documents or links on this site, please ensure that you have disabled your browser's pop-up blocker for this site. Click here for more information.